Updated links and added new data set. So you want to make a map of NYC. You are familiar with the NYC Open Data Portal but have had some difficulty in finding all the data you need. You have the requisite software to construct the map (e.g., QGIS, ArcGIS, MapBox Studio, etc.) and the basic skills to do so. Perfect, read on. This post is intended to provide a single source for the map ingredients. It is not intended to be the map cookbook. It’s up to the reader (i.e., mapper) to decide on data to include, colors, symbols, labels, fonts, etc. 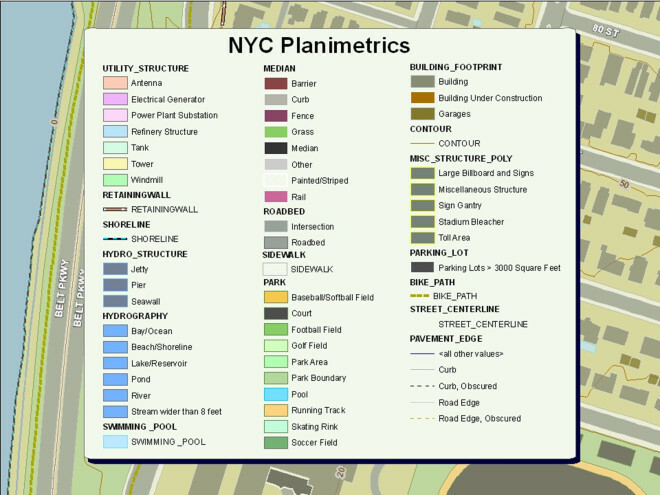 The table below lists NYC DoITT geospatial data on the Open Data Portal and provides a very basic description of each data set. For more detailed information, see the included metadata. The table is grouped into core basemap features and other DoITT data. What is the City Map (of New York City)? Let me begin by first explaining what the City Map is in the physical sense. It is not one comprehensive map showing the entire city that you could roll out on a large table (or basketball court), but instead it is a collection of thousands of maps of small areas of the city, each of which shows “the official adopted map of the city” for a that limited area. These maps are called alteration maps. Here is an example of an alteration map. An alteration map becomes part of the official City Map whenever “the location, dimension and grades of streets, parks, public places and certain public easements” are changed anywhere in the city and that map change becomes effective. The “becomes effective” bit is important because unlike some other ULURP Actions, City Map changes are NOT effective upon adoption by the City Council, but must wait until the day after they are “certified and filed” with the Department of City Planning. The certification and filing step that makes the map part of the official City Map may not take place for several years after adoption by City Council. For example, the adoption date for the map change shown above was 04/28/2010, as stated in the paragraph above the “certified and filed” date. However, the alteration map was “certified and filed” on 02/27/2015 and so it finally “became effective” on 02/28/2015, almost five years after it was adopted. The enlargement shown below, taken from this particular alteration map, reveals another interesting point- note there is no mention of the City Council anywhere in the paragraph. This is because the ULURP process allows the City Council a limited amount of time to take action on a City Map change following adoption by the City Planning Commission. If the City Council takes no action before that time expires, then the City Planning Commission’s adoption is considered final and the map then becomes effective the day after it is “certified and filed.” Had the City Council elected to take action on this map, there would be additional text showing the City Council’s adoption date and calendar number. If either the City Council or the City Planning Commission had rejected the map change, there would be no paragraph at all, and no map either, for that matter. City Map changes that are rejected are discarded. This is a good point at which to answer the question of “Why should I care about the City Map when Google has a perfectly good map of the city?” The official adopted map of the city is not the same as Google’s map (or Bing or OpenStreetMap or even NYCityMap). While these other maps are good for showing what exists in the physical world , the City Map also shows streets that are official but have never been actually constructed. Also, the City Map will not show any streets that are not actually official city streets. Well, that last statement is not entirely true. The City Map does show, usually with dashed lines, what are known as “record streets.” These are streets that were present when the alteration map was created, but are not actually part of the official City Map. Record streets may or may not still exist in the real world, but for official purposes they are known as “streets of record” and they may be used for legal descriptions. The City Map can affect someone who is looking to build (or rebuild) in an area where the built streets do not conform to the official City Map. This condition applied to parts of the Breezy Point neighborhood in Queens, an area damaged extensively during Hurricane Sandy. Many structures that were destroyed by the hurricane were built on top of officially mapped streets, which resulted in delays in obtaining permits to rebuild. Therefore, if you are thinking of building a(nother) new pie store on a vacant lot you saw in Google Street View (or while out walking), it is helpful to consult the City Map first. There could be a mapped street on the lot. If it seems incredible to you that the entire extent of New York City could be completely covered by these limited-area alteration maps, then you are justified in that belief. There are many areas of the city that are not covered by any alteration map at all. So then what makes up the official City Map in these areas where there is no alteration map coverage, for example, all of the pink areas in the image below? The Borough Presidents’ Final Section Maps are the answer. Within the Borough President’s Office of each of the city’s five boroughs can be found a Topographic Bureau and a borough engineer. These Topographic Bureaus are the custodians of that borough’s Borough Map (also known as Final Section Map) along with all of the alteration maps filed within that borough. For any area within a borough that is not covered by an alteration map, the Borough Map is the official City Map. Every borough has its own style of Final Section/Borough maps. Personally I find the Queens maps have the best cartography. Below is one of them. Now we have established enough of the background understanding necessary to answer the question of what is the official City Map with a little more precision. The official City Map for any area within the city is the most recently filed alteration map that covers that particular area. If there is no alteration map coverage, then the official City Map is the Borough Map. This seems pretty simple in concept, but often the determination of the official City Map for a particular area requires consultation of multiple, overlapping alteration maps plus the Borough Map, making it difficult to get a complete picture of what is official for the exact area that you care about. Wouldn’t it be great if someone synthesized all those alteration maps and Borough Maps into one single map or set of maps so your City Map research could proceed at more of a crime-scene-investigation-TV-show pace? Well, for all you CSIs of urban planning out there, the DCP Street Sectional Maps and Zoning Maps are your answer, mostly. The DCP Street Sectional Map is essentially a schematic representation of the official city streets. I say schematic because, while the maps drawn to scale, sometimes the density of line work requires a bit of out-of-scale manipulation to make the street lines clear. The point is to provide a quick reference to the official city streets, not to make accurate measurements on the map. Street Sectional maps only show official (and record) street lines, official (and record) street names, honorary street names, parks, and public places. There are no dimensions or grades shown on these maps. Record streets are shown as dashed lines… but so are hidden lines, like underpasses, for example. You have to go by context to judge which dashed lines are record streets and which are underpasses. The Sectional map is available for free at some public libraries and for purchase at the DCP Bookstore. There are thirty-five, 24” x 36” map sheets covering the whole city. Unfortunately, the Sectional Maps are only current to around 1997- the exact “current to” date is printed at the bottom of each individual map. Here is Street Sectional Map 8 which covers a popular section of Manhattan. Fortunately, the Street Sectional Map is also the base map for the Zoning Map. Each of the 126 Zoning Maps covers a quarter portion of a sectional map. For example, the above section map 8 is covered by four zoning maps: 8a, 8b, 8c, and 8d. Zoning changes and City Map changes are often related to each other, and, probably because zoning changes more frequently than the City Map, the streets as shown on the Zoning Map are kept current to the present date. So, if you need to make a quick check on what the City Map is for any area, skip the Street Sectional Map and go directly to the Zoning Map. A) If you just need a general idea of what the official streets are in a particular area- just look at the zoning map. This will show you what the official street layout is. B) If you are involved in serious land use business and you really need to know exactly what the official streets are, then you should go to that Borough President’s Topographic Office and research the filed alteration maps and Borough maps for your area of interest. 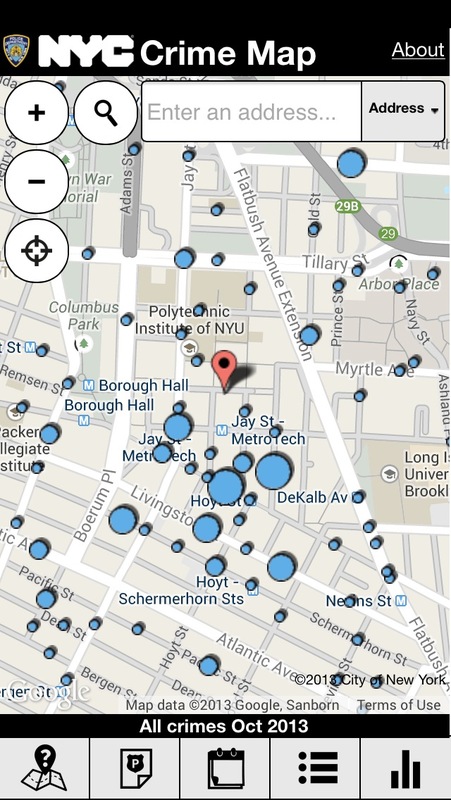 Geoclient is a geocoding API that recognizes and geocodes addresses, intersections and blockfaces (on street and two cross streets) located in New York City. The Geoclient service provides a RESTful web service interface to the Department of City Planning’s (DCP) Geosupport system. Geoclient provides “pass-through” style access to native Geosupport functions. It does not change or modify Geosupport functionality in any way. However, Geoclient does add some very useful features (some of which are considered standard by today’s developers). While Geoclient is intended for programmatic use, DCP hosts GOAT, a website that provides direct access to Geosupport native functions. Geoclient developers often use GOAT to compare results or test data interactively. There are two primary Geoclient installations. One is for use internally by official City agencies and the second intended for the public developer community. However, the data and logic behind all instances of Geoclient are exactly the same. By sharing the same code base and deployment scripts, it is easier to maintain and support. For the public, access to Geoclient is through the NYC Developer Portal. For City agencies, contact us directly. Geoclient provides two notable enhancements which can be used to simplify and optimize access to Geosupport. The first is single-field search functionality which parses a single input string into the discrete location elements that are required by the different Geosupport functions. For example, an input of “59 Maiden Lane, Manhattan” is parsed into its house number (59), street name (Maiden Lane) and Borough (Manhattan) for submission to Geosupport. Note that parsing is not case-sensitive, punctuation is ignored and most standard street pre- and post-modifiers, types and directionals are recognized. A fully qualified (i.e., expanded) address is often referred to as a ‘normalized’ address. An example is ‘314 w 100 st mn’ which is the equivalent of the normalized ‘314 West 100 Street, Manhattan’. Normalization is native to Geosupport. If your data is already parsed into discrete address elements, using the /geoclient/v1/address endpoint directly is less ambiguous and slightly more efficient. Building on it’s ability to parse single-field search locations, Geoclient can also be used to “guess” the intended target of an incomplete or ambiguous input. One example is the submission of an address without a borough. As long as Geoclient can recognize the search text as an address (house number and street), the /geoclient/v1/search endpoint will try that address in all five boroughs. By default, if the address exists in one or more boroughs, all locations will be fully geocoded and returned as possible matches. This behavior can be customized, for example, by calling the service with the optional ‘exactMatchForSingleSuccess’ parameter set to true. In that case, if the address exists in only one borough it will be geocoded and returned as an exact match. Using the previous example, entering “59 maiden ln” without the borough will result in the same response as entering “59 Maiden Lane, Manhattan”. 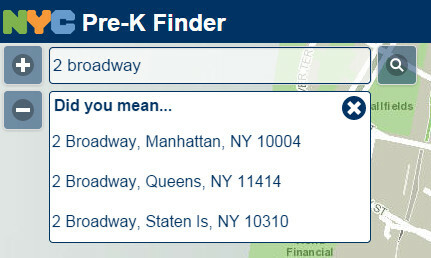 The figure below shows the response for “59 Maiden Ln” using the Pre-K Finder application. In cases where the same address exists in multiple boroughs, Geoclient will return a candidate list of possible addresses. In each case, the candidate address is validated to ensure a successful response. See example below. Developers can customize this and several other search features as documented by the Geoclient API. Hopefully this will clear up some of the misconceptions associated with Geoclient and contribute to the knowledge base. And please check back in the coming weeks for a more detailed Geoclient post. In addition, expect some enhancements over the coming months. Nice work Matt! 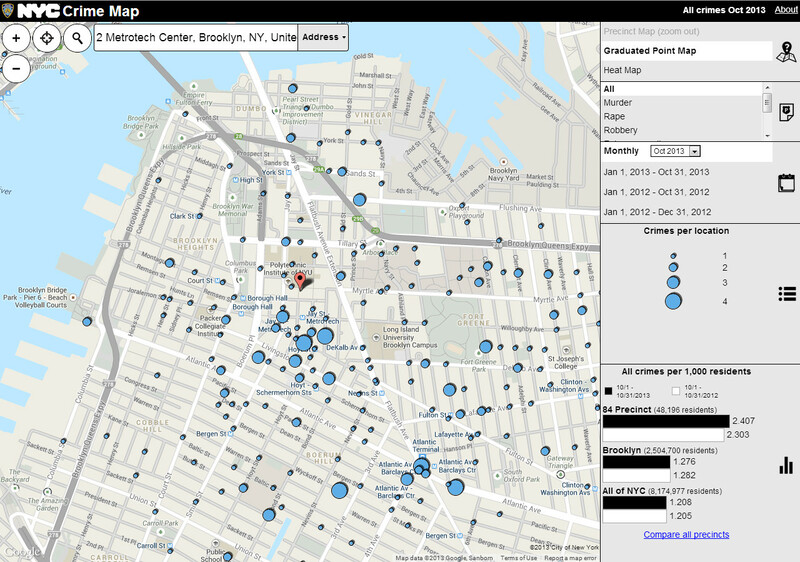 On December 8, 2013 New York City launched the NYC Crime Map. In collaboration with the NYC Police Department, the NYC Crime Map was developed in-house by DoITT GIS staff using Google’s Maps API, Places API and Maps Engine. The application went through multiple rounds of intensive code reviews with Google engineers and rigorous regression testing by DoITT Quality Assurance staff. Map Engine Query Per Second (QPS) and Query Per Day (QPD) limits were increased to accommodate the expected high volume of traffic. These measures were taken to ensure a smooth release and positive experience for the users. The application follows a responsive web design approach and is therefore optimized for most modern smartphones, tablets and desktop computers. The screenshots below demonstrate the layouts in a desktop browser and iPhone. To protect privacy, crime data are located at the nearest intersection of a crime or the midpoint of a City block (approximately a street defined by two intersecting cross streets) for crimes occurring at a discrete addresses. For a detailed description of the data methodology, see the About page. Crime can be visualized as graduated points, shaded precincts (i.e., choropleth) or a heat map. The graduated point view renders the data as points varying in size by the frequency of crimes at that specific location. In this way, locations with greater occurrence of crime will have a larger point. The precinct map aggregates the crime to the precinct level and normalizes the data showing aggregate crime rates (crimes per 1,000 people). The precinct view provides a city wide view of the data and allows for comparison of crimes across the different precincts that make up NYC. The heat map uses the Google Map API heatmap function to show the relative concentration or intensity of crime. Local Law 39, passed by the City Council in May,2013, was the basis for the interactive crime map. This legislation provides the public with a more detailed view of crime within NYC than previously possible. As per the legislation, crime data is available for the current year and previous year and is aggregated by month, year to date and full year. The data will be updated monthly as it is received. Addition of an Advanced tool. Within this are the previous tools that existed over the base map. Replacing the slider with Map Type tool. Many users were confused by the slider and the ability to toggle between a cartographic map (Map) and the numerous years of aerial photography. All of these base maps still exist but are are now within the Map Type tool. The base map selected is shown by a check next to the entry. Where is the identify tool? The current release of NYCityMap includes interface updates and addresses issues resulting from the recent update of Chrome (version 29). The interface changes were a result of feedback received and are intended to improve the user experience. The identify tool was removed; however the functionality still exists. The default tool (Pan) now handles this function similar to Google and Bing Maps. On single left click of the mouse, the tool identifies map features provided the user is zoomed enough to see the feature being identified. On left mouse hold the tool pans the map. The code changes required due to the Chrome update were related to Dojo widets employed by NYCityMap. These widget were not rendering in Chrome properly. To those who were impacted by this issue, we apologize for the inconvenience. We had made the code changes and were already through testing and ready for release when the Chrome issue struck, We therefore released both changes together. Change the Show Aerial Photo tool to a button title Map Type. On click menu items will show the different Aerial Photography years. Change the drag zoom and measure tools to single action (i.e., after single use the tool defaults back to pan/identify/zoom. These changes are underway and we expect to release these barring any unforeseen issues by the end of the month. 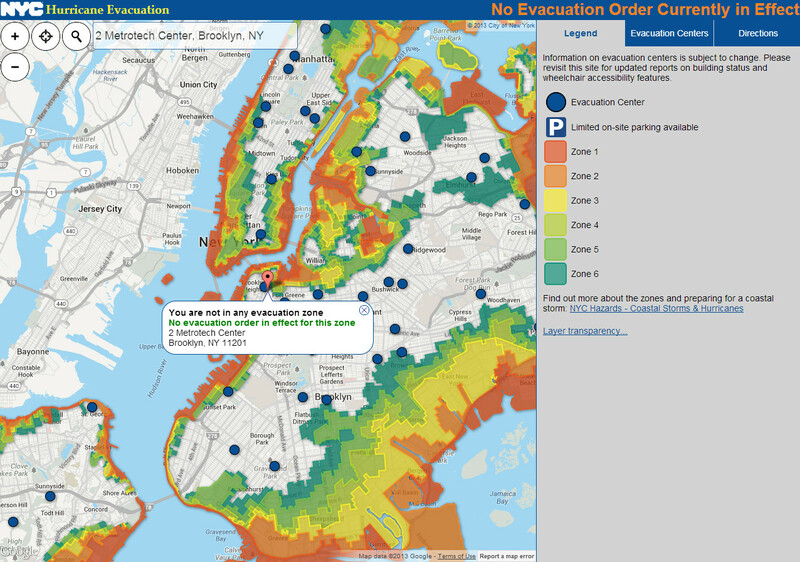 Coinciding with the release of the new New York City hurricane zones (see press release http://on.nyc.gov/12HfnB4) is the release of a new Hurricane Zone Finder application. The application was developed by NYC Department of Information Technology and Telecommunication (DoITT) in collaboration with the NYC Office of Emergency Management (OEM) and includes improvements over the previous version. Application improvements include mobile browser support, address search enhancements, multi-modal transit directions and enhanced messaging. Additionally, the transparency of the hurricane zones can be adjusted to clearly display street names and landmarks for better orientation. To do so, click ‘Layer transparency…’ at the bottom of the legend. The new Hurricane Zone Finder application was developed using Google’s Maps Engine and Maps API. The hurricane zones and evacuation centers are stored in the cloud-based Maps Engine data store and published directly to the Google Maps API. Maps Engine is also queried to determine if the geocoded address is located within one of the six hurricane zones. 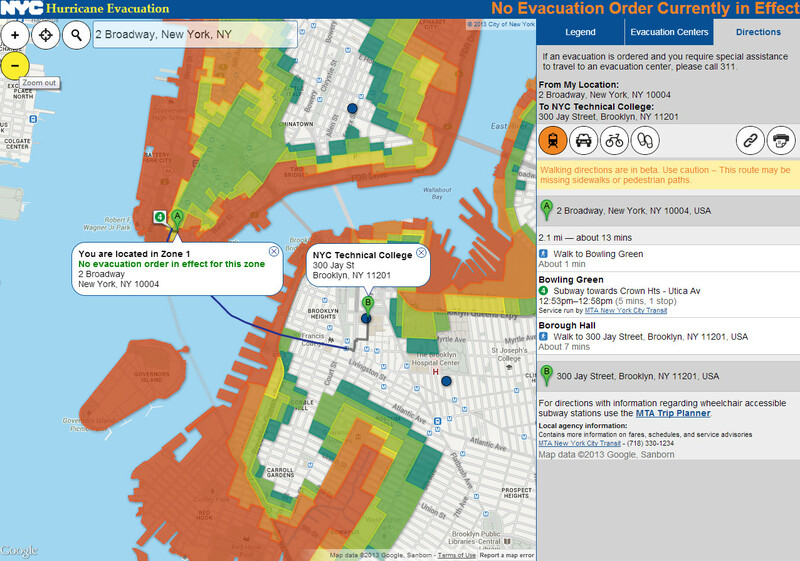 Maps API and Maps Engine provided the ability to quickly develop an information-rich application while providing the necessary cloud resources to handle the traffic experienced during Hurricanes Irene and Sandy. The evacuation centers are shown on the map and listed on the Evacuation Centers tab, in ascending order based on distance from the searched address. Directions are provided for each evacuation center or by default for the nearest evacuation center. When an evacuation order is announced, the application will specify for which evacuation zones the evacuation order is in effect for. At all other times, the residents of New York City can use the application for pre-planning and preparation. Comments made by the public to these sites are reviewed and, while comments will not be edited by City personnel, a comment may be deleted if it violates the comment policy described here.